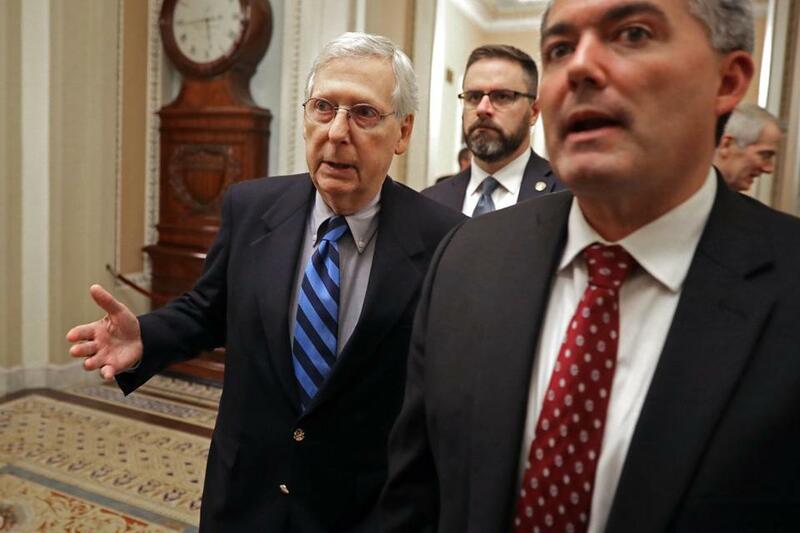 Senate Majority Leader Mitch McConnell (left) walks to the Seante floor with Senator Cory Gardner in December. Nothing is more fundamental to our democracy than the right to vote. That’s why Senator Mitch McConnell will not abide efforts to make exercising that right any easier. The Senate majority leader, who all but disappeared during the recent partial government shutdown, has reemerged to denounce “the far left” for what he characterizes as a bold attempt to “seize more control of the political process.” So what fiendish sleight of hand are these nervy Democrats promoting to harm Republicans? They want to make Election Day a federal holiday. Oh, Mitch. I can smell what you’re cooking up. It’s an attack on democracy. Some who seldom vote often cite difficulties squaring polling hours with their work schedules. A national holiday would ease such conflicts. In a nation that ranks embarrassingly low in voter turnout, you’d expect bipartisan support for a measure designed to make it easier for people to get to the polls. But more voters are what McConnell fears, because that usually translates into more victories for Democrats. November’s federal elections boasted the highest midterm turnout in a century, and Democrats outvoted Republicans by more than 4 million. Voters aren’t buying what the GOP is selling. Democrats reclaimed the House by a wide margin and aren’t taking any guff from President Trump. McConnell will double down on his attacks on voting to further an agenda that sows division, widens economic inequity, and benefits only the wealthiest. Making Election Day a national holiday is a small part of a reform bill Democrats have dubbed the “For the People Act of 2019.” Its goals include expanding voting access, restricting big-money influence in politics, promoting independent redistricting commissions, Election Day registration, and nationwide early voting. McConnell has branded it with his own name: “The Democrat Politician Protection Act.” In his worried mind, these changes will only benefit those on the opposite side of the aisle. If Republicans weren’t so adamant about undercutting democratic principles, none of this would be necessary. This act seeks to stanch wounds inflicted in 2013 when the Supreme Court essentially gutted the Voting Rights Act. Ever since, the GOP has taken extraordinary steps to deter voters of color, young people, and the poor from exercising their constitutional right. Those steps can change election outcomes. In November, Democrat Stacey Abrams narrowly missed becoming this nation’s first black woman governor. While running for Georgia’s top office, her Republican opponent, Brian Kemp, remained secretary of state — and controlled the election. Accusations of voter suppression were widespread, after Kemp’s office systematically shrank the voter rolls and stalled approvals of new registrations. For Republicans, a stolen victory is still a victory. McConnell’s actions are no less appalling. Of course, he has never shied from viper-like tactics to reach his political ends — just ask Merrick Garland. Like the president he slavishly serves, McConnell keeps shattering every how-low-can-he-go measure. What McConnell is doing is nothing less than waging war against democracy itself. This nation’s lofty principles have always promised more than they’ve delivered, and even that is more than McConnell is willing to allow. Voting is power, and that’s why white men like McConnell have connived for centuries to hoard that right. Months before President Obama was elected to his second term in 2012, Republican Senator Lindsey Graham said of his party, “The demographics race we’re losing badly. We’re not generating enough angry white guys to stay in business for the long term.” Unable to attract more people of color and women — no surprise, given the party’s embrace of racism and misogyny — the angry white guys won out. Now the GOP is led by the Angriest White Guy-in-Chief. Most Americans support efforts to make voting easier, but their needs are lost on McConnell. Opposing an Election Day holiday, which would benefit all voters, is yet another egregious act by a man recklessly leading a party whose every wrong move hastens its steady demise.